If you enjoy researching go facts and are good with words, consider being on the AGA Website Transition Team! The AGA is revamping its website, and part of this project involves going through each existing web page and updating information to make it as current and useful as possible. We’ve already got a great team of volunteers working together on this exciting project, and could use a few more folks to finish up the project and get the new site launched. For example, our current World Amateur Go Championship page shows stats through 2010, so we need to track down who represented the U.S. at the 2011 WAGC and list how they did. No technical skills are required, and we expect this phase of the project to wrap up by the end of November. If you can help — even with a limited time commitment — contact Roger Schrag at rs1249@bayareago.org. Go author Jonathan Hop is starting a video lecture website aimed at popularizing go and providing more resources for people who want to learn more. 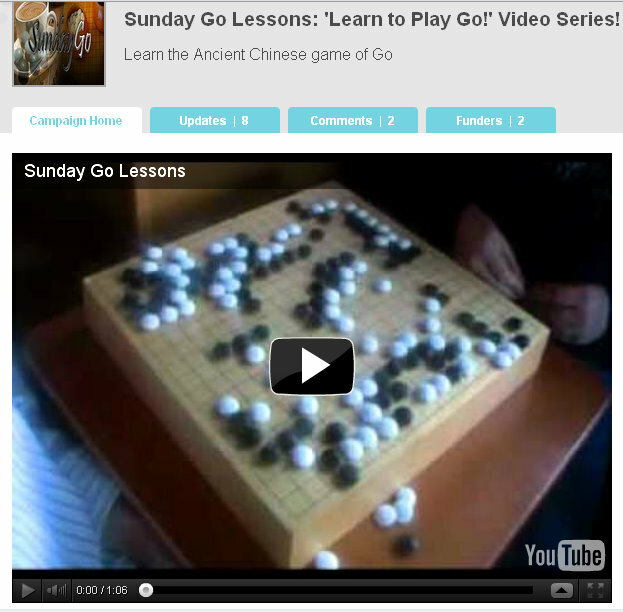 The website, Sunday Go Lessons “will eventually grow to have hundreds of lectures on various topics, from joseki to the middle game, and will present go in a fun and exciting way,” Hop tells the E-Journal. “Perfect for getting friends and colleagues acquainted with the game.” Looking for financial contributions from the go community to help get his dream off the ground, Hop is offering prizes for contributors, including free lectures and signed copies of his books. Jonathan Hop is a 4 dan amateur and studied at the Yu Changhyuk Baduk Dojo in Migeum, S. Korea and is also the author of the So You Want to Play Go?series, a primer for players of all skill levels. Click here for details on the new site. Leading networking company TRENDnet is sponsoring a brand-new tournament in Southern California. The first annual TRENDnet 2011 Southern California Go Championship will be held December 3-4 in Alhambra, California, reports Orange County Go Club organizer Kevin Chao. The five-round tournament includes a $2,000 prize pool and a $500 top prize for the open section. TRENDnet, a Torrance, CA-based global provider of award-winning networking solutions to small and medium size business and home users, has committed to sponsoring the tournament through 2013. Since its start in 1990, TRENDnet — under the slogan “Networks People Trust” — has built a diverse product line that includes wireless, fiber, wwitch, gigabit, voice over Internet Protocol (VoIP), keyboard/video/mouse (KVM), Internet camera, print server, powerline, Bluetooth, storage server, power over Ethernet (PoE), and multimedia accessories. SHREWSBURY TOURNAMENT, 2 October: The winner of this year’s Shrewsbury tournament was Toby Manning, after a long struggle with Baron Allday. Kathleen Timmins also won three games. Although numbers were down on last year, those present enjoyed the tournament and commented that the shift to Sunday had made travel and parking troublefree. SWINDON TOURNAMENT, 18 September: The Swindon Tournament went well and attracted 36 players. Winning again after a gap of six years was Bei Ge (5 dan), who beat Francis Roads in the last round. Francis led the Wanstead club to victory in the team prize. The only other player to win all three games was young Aidan Putman (12 kyu) from Swindon, so a special prize went to Adan Mordcovich (2 kyu) for two good wins. BRITISH CHAMPIONSHIP FINAL, CAMDEN, LONDON, 17 September: In an exciting third and deciding game Matthew Macfadyen killed a group early on and held on against everything Nick Krempel could throw at him. Eventually Nick had to resign allowing Matthew to be champion for another year. The records of all three games are on the BGA website. 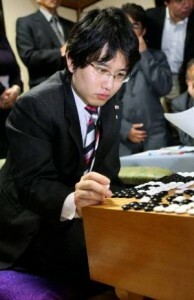 Guo Juan has kindly commented all three games and has created free audio lectures which are linked from the BGA site. NORTHERN TOURNAMENT, STOCKPORT, 11 September: Richard Moulds won this year’s Northern tournament. Although there were only 21 players, there were four other prize winners on maximum wins, namely: Ron Bell, Roger Huyshe, James Brownrigg and Brian Timmins. Also noteworthy is the fact that Adan Mordcovich from Wanstead, the youngest player to attend, was placed second overall. CORNWALL TENZANCE, 10 – 11 September: Sue Paterson won the Cornish Rapid Handicap on the Saturday and Ian Marsh won the Cornish Open on OURNAMENTS, Pthe Sunday. 20 people took part in all over the weekend that included a teaching session as well as the two tournaments. BELFAST TOURNAMENT, 27 – 28 August: Andrew Simons was unbeaten winner at this year’s 22-player Belfast Tournament. Matthew Crosby was second with 4 wins, only losing to Andrew. Also winning 4 were Poland’s Justyna Kleczar and Marek Gutkowski. Winning 3 to come third was local player James Hutchinson. MIND SPORTS OLYMPIAD, LONDON, 27 – 28 August: In the 13 x 13 tournament Matthew Cocke proved the best of the 8 players. Silver place went to Francis Roads winning 6 but losing to Matthew. Bronze place went to Henry Manners with 4 wins on tie-break from Xinyi Lu and event arbiter Tony Atkins. Matthew then went on to collect his second MSO Gold in two days, by winning the 16-player Open. Silver went to Adam Pirani who lost to Matthew in the last round. 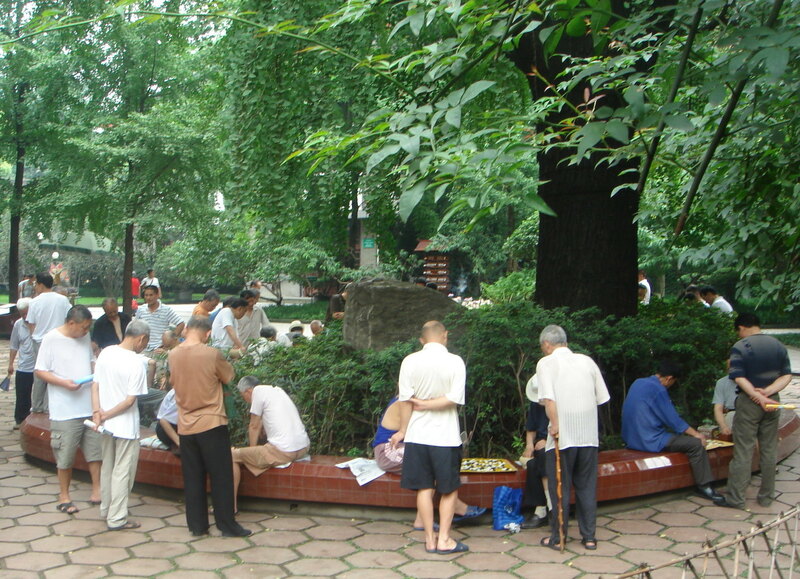 Equal Bronzes were Francis Roads and Chu Lu from China. Paco Garcia from Spain was fifth. - as reported in the October edition of the British Go Association newsletter; more information on upcoming UK tournaments is available here. 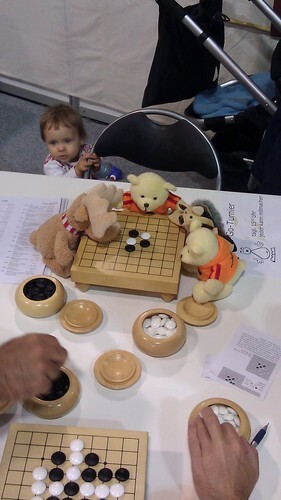 Computer go has improved dramatically in recent years, For instance, a program named “Zen” recently earned a rating of KGS 4D by playing 83 games in 24 hours at that rating, and winning 60 of them. Peter Shotwell (l) has written about computer go for years, and covers all the latest advances in a thorough update of his article available from The Bob High Memorial Library, entitled, “A Time Line of Supercomputer Go: Temporal Difference Learning to Monte Carlo Programming.” Also available are two appendices featuring interviews with some of the more prominent programmers. Shotwell also joined the critical reaction to Henry Kissinger’s recent use of go principles to explain Chinese thinking, posting “Thoughts on the Relationship of Go to On China by Henry Kissinger and The Protracted Game by Scott Boorman,” arguing in detail that neither of the books contribute much towards understanding the basic differences between Eastern and Western history, thinking and language that are the roots of the differences in strategic outlooks, both past and present. Two dozen go players turned out on October 29th in Rochester, NY to play in the seventh Greg Lefler Memorial Tournament. In three rounds of play the following winners emerged: Dan Section: 1st: Qiyun Zhu 8d; 2nd: Yidong Wang 5d; 3rd: Phil Waldron 5d. High Kyu Section: 1st: James Feinup 3k; 2nd: Jim Gonella 6k; 3rd: Sean Reeves 8k. Low Kyu Section: 1st: James Howard 19k; 2nd: Patrick Wesp 13k; 3rd: Angel Lomeli 20k. The tournament is held annually to honor Rochester go organizer Greg Lefler “who taught us all to love go and to promote it in anyway we knew how,” reports Steve Colburn.